Scared Stitchless: How do you choose your fabric? How do you choose your fabric? Today I found myself wandering through some handmade markets surrounded by fabric sewed into bibs, children’s clothing and pram blankets. If something could be turned into something else with bright, colourful fabric then it was there on someone’s stall being displayed and sold. My mum kept pointing out how many of the things there I could have sewed myself. The only barrier being the appropriate pattern and a whole lot of time. I guess what struck me about this whole set up was just how handmade everything looked. Don’t get me wrong their stuff was stitched beautifully - trust me, I looked. So I guess the thing that got me was the choice of fabrics. So much of what they were were selling was made from cutesy quilting cotton. Which I love, I do. In fact I’ve got a whole lot of dresses lined up in some bright quilting fabrics for summer because I find them really fun and individual to wear. But it made me stop and think that maybe when people see me wearing what I’ve sewn they think the same thing? There goes that girl swathed in cutesy quilting cotton. Bet she made that herself. I think this was all brought to a head by sitting down to watch Project Runway straight after. I see these incredibly talented designers heading into a fabric store and walking out with different stuff to what I would choose. I see them turn a concept into a finished product and what they end up with is something commercial and incredibly expensive looking no matter how much they spend on the actual fabric. What I’m trying to say is that whether I’ve seen it along the way or not my sewing is changing. I used to be so incredibly excited just to follow a pattern and end up with something wearable that I hadn’t stopped to think about the editing. The editing! The Tim Gunn moment when you really evaluate what you’re making, how it’s going to look when worn, whether the fabric is true to what you’re making and what you want to achieve, whether the silhouette works for your body type. I find myself pinning pictures on my Pinterest boards like this one of all the clothes I want to make. Then I find myself online shopping for fabric because it’s cutesy or a bit different or because I’ve never seen it in a store before. What I’m noticing now is a gap. Between what I want to make that I’d realistically wear in my wardrobe, and what I actually buy fabric for. There is a notable divide between fabric I will buy to make things out of and what I actually want to sew up for myself to have a versatile and on fashion wardrobe. I’m not sure if this happens to you as well. I’m not sure if I’m the only one struggling to bridge this gap. I’m also not sure that I’m going to stop buying funky, cutesy fabrics because they’ll make my things look handmade. I think this is just my moment to recognise that my sewing has turned from a fun little hobby to a way to project who I am as a person, who I want to be and how I want people to perceive me whether they know I’ve made the garment or not. Is there anyone else out there who sees that gap I’m talking about? Does it bother you enough to change your fabric purchases? I’d love to hear from you! My biggest fabric struggle is being restricted to what I can buy in my home town. Internet fabric shopping does not appeal as I can't feel the drape of the fabric. I often reject fabrics in the store for this reason so I can't see that internet shopping will be a happy experience for me. My biggest struggle is coming to accept while I might like a certain pattern designer - and love the clothes other stitchers create, the reality is that they just don't suit my body type and some of the styling is just not me and I need to move on and stick to the deisgners and pattern companies that work for me. Yeah you're right. You really have to find patterns and fabric that work with your body not against them. Also I'd never thought about the fact that some people don't shop for fabric online. I know when I go into a fabric store I pretty much touch everything. It makes sense to not feel a connection with a fabric since you don't know how it will sit and drape. Another conundrum to think about next time I'm searching for fabric. LOL I hope I haven't increased your woes! I know the gap! I struggle with it often, to the point where I'm too nervous to even buy prints - I'm learning though! Agree with you as well, it's all well and good sewing something and being proud of it, but if the fabric's off then it just doesn't look as 'proper'. I saw it at fabric-a-brac today; a stall holder (and she was LOVELY) was showing me her skirt but it looked so homemade. She had a doily stitched onto it, and 3 different kinds of quilting cotton in panels. She was so proud of it, but it was just home-made to the point of obviousness (and a bit of an eye-sore as well). I think sewists can fall into the trap of embellishing too much. We have so many options and it's all so exciting we can go overboard, and end up with the example above. I have just finished a top with a lace peter pan collar and was unsure about sleeves - I asked my Mum and she said to go for one interesting point. And I think this is good advice. Lace peter pan collar, everything else simple. Use one quilting cotton in your garment, not more, and if it's loud, keep the pattern simple too. If you really want the doily on your skirt, use a plain fabric so it's not competing against anything. Tim Gunn is wise - we ought to edit from the first moment we eye up that lovely fabric, and decide how well it will fit into our lives! Yeah, I'm glad it's not just me. I can see the beauty in what others create (as well as my own) from prints but I think we all get so overwhelmed by choice really. Wise words from Mama Gypsy and great that you have your own version of Tim Gunn to help you edit! I think I might just keep all this in the back of my mind when choosing my next projects. Lots of sketching coupled with standing in front of my wardrobe deciding what it will go with may just help me to choose fabric better. Yes! There is a gap, I noticed one myself a few years ago. At the time, I was working in a quilt shop... I've developed something of a horror of looking like a walking quilt. If you know what I mean. I think you do. By the way, your pinboard is super cute and I want to re-pin -like-everything on it. I think you have a great sense of style. You know I think you just nailed it. If I bought a pile of fabric in solids I'd be having a yawnfest at my sewing table but, guess what brain, that's exactly what I need right now! And really when you think about it the simpler the fabric is the more detailed or designed you can make the piece so it can speak volumes about you without the need for a print with personality. This post really resonated with me. I think the urge to create is sometimes stronger than our inner Tim Gunn. I know I was certainly guilty of throwing all sorts of fabric and patterns together only to think 'meh'. Now, I'm trying to be more edited and am mixing refashioning with original creations. It helps keep me focused on wearability rather than making something because I have a crush on the fabric. And @juliet's mum is so wise 'go for one interesting point'. Genius. That's a great point. I think refashioning would certainly help to keep concentrated on the pieces you actually need to build a wardrobe and then you can fill the gaps with your own sewing. Great post and food for thought for me - I must admit, my sewing tends to be for my kids, I rarely make anything for myself. I do tend to be drawn to cutesy prints for the kids, but my greatest successes and garments I've liked the most tend to be made from ditsy florals, simple polka dots or solids. Yeah I think one day I'll be really excited to sew for kids and then I can use all the cute prints I've hoarded. It's nice to know that, what you call your successes, have been from more solids in terms of fabric. This is such a great post! I sew maybe 70% of my wardrobe now, but it still isn't functional because I sew so many whimsical prints that match nothing. I have a closet of 'one offs'. 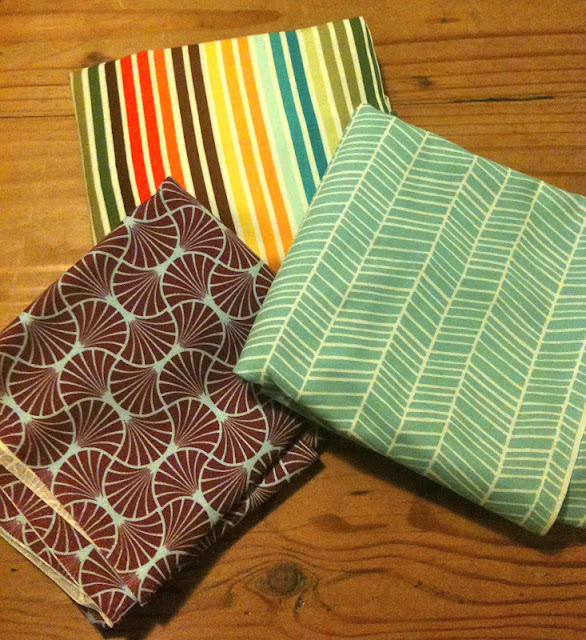 When i shop I never get excited about solids- I need to start making some interesting designs with more solids. I know they can loolk great- I've seen it! Yeah I'm the same. I love having 'one-offs' that are very me and made completely by me but I think there is a lot to be said of understated and yet interesting designs. Along with only buying solid colors (and a few stripes or so) I think one of the most important things to consider is fiber type. Always pick natural fibers. If you are going to go to the trouble (well, time commitment anyway, wouldn't call it trouble) of creating your own garment, it's worth it to buy natural fibers (cotton, linen, wool, silk) rather than 100% polyester or another synthetic which will not feel good to wear all day and will not have the texture of a natural fiber. I do love rayon and cotton/poly blends though. Another way to choose fabric - consider the fabrics that you wear all the time from store bought clothes. Look in your closet (at the clothes you actually wear). In mine for example almost every item is a solid color, mostly deep colors, mostly cotton/poly blends or cotton, wool or blended wool for sweaters, etc. I'm not a fan of graphics or prints, though I have a few striped sweaters. A lot of girls would find that boring, but fit, color, and silhouette are so much more important to me than what is actually *on* the fabric. I think it's better to use clothes to showcase the person wearing them instead of to show off a loud graphic or bright color combo. Great advice on the actual type of fabric your purchasing. Often I'm distracted by a pretty colour or a nice drape but you're right it's much more important to focus on the fit and silhouette of the end product. Perhaps this will motivate me to learn a bit more about designing with textiles. It's actually an exciting point to be at. Reading these posts makes me think about my plain little denim 1247 skirt. It's a simple solid but a very clever pattern design wise. Perhaps find the challenge in the pattern not the fabric? I tend to put my quilting cottons into my projects as pocket linings and bindings. Then you can still enjoy the fun fabrics - its you little secret - and the project doesnt look homemade. I was just mulling over this very topic! I'm always drawn to the quilting cottons because they can be so cheerful and it's most varied area of the store. But, I generally leave without them because I don't know how to choose a print that won't look homemade (even with the few I've made into dresses, I few a little nervous about them). I've all but come to the solids conclusion too. I keep thinking I'd like to make a floral 1940s shirtdress but, I worry it will look homemade or dated. However, the solid navy challis I have slated for a similar project, I have no worries about. I also agree with Kaylee - fiber content and drape is very important. Even cutesy cotton rtw tends to have a nicer hand than your average quilting cotton which will make all the difference once it's on you. You're exactly right. It's not that I don't love my dresses I've made in bright prints it's that I'm nervous about them. They're me and they're not me at the same time and I can't seem to resolve that problem when I'm wearing them. I know what you mean by "looks handmade". Mates from work asked if I wanted to go to Flemington Craft Market this weekend and I said I wasn't interested.. my reason was that I didn't like "hand made looking stuff" which they thought was odd since I handmake some of my clothes. BUT! that skirt I made probably looked hand/home made because it was a simple gathered skirt so it looked a little dodgy... Natalie from the blog Laika Doll makes the most awesome vintage style dresses and she used quilting fabric.. with animals and stuff on it and they don't look wierd at all!! Sure people would think that it's custom made, but the fit and style is so good that its fantastic... not like my dodgy gathered skirt hehehhe. I went to a market once and bought the most adorable hand made baby bibs... they were made from quilting cotton but it was the Dr Suess and Hungry Catapillar design so I gave it to my friend as a baby gift confident that she wouldnt think it was some dodgy cheap bib I got from a $2 shop... the bibs were $15 each! You know I think there's something in what you said about being super proud of something at the time of making it but looking back on it with a little retrospect makes you reluctant to wear it. I think I'm still in that phase a little. I still love having created something so individual and unique but I don't wear them much or for very long. The key is in the editing. Yeah I love nothing more than to sit down and sketch out some ideas of things that are great pieces to build my wardrobe - particularly after buying a fashionary! But even so I just get SO distracted in fabric stores. I'm literally crippled by choice. You're right though I don't think any of us should ever give up prints. I'm certainly not going to. But I think it's important for me to step back and gain some perspective, sew with solids for a while and incorporate prints back into my wardrobe in a way that makes sure I'm actually going to wear them. I love colour and prints, so tend to keep on buying those. And actually, I wear them too. Maybe I look "home-made", maybe I don't. Although they tend to be garment fabrics, not quilting cottons (although I use them too at times). For me, print and colour is all about having fun. But I have made a concerted effort recently to add more solids to my stash (and spots and stripes count as "solids", by the way). Interesting blog post with lots of food for thought! oddly, this is something i have been thinking about recently. I am pretty much a newbie sewist, and i think when you start it is easy to go with cottons and the prints catch your eye. i am only just starting to understand different fabric types and how they drape (not helped by the fact that a lot of the sewing blogs i read are US based and I think we sometimes use different names for fabric in the UK). i do love spots and stripes though so i'll still use those, but i am focusing much more on the right type of fabric for the right garment rather than a cute print. for example, i am making a couple of plain tees to fill a wardrobe hole, one in grey marl. it is the most basic item, but the jersey is so gorgeous and soft that i am really looking forward to sewing with it! to help, i am thinking of joining one of those swatch services so i can see the different types of fabric that are out there and learn a bit more. i totally agree with the person above who said that we all want our clothes to look handmade, not homemade! Yeah, maybe part of the problem is my limited understanding of fabric and how it drapes. I certainly feel all the fabrics when I go shopping but I'm not always certain how to choose the specific fabric for what I have in mind. That swatch thing sounds great! Yeah print and colour is definitely about having fun and I feel like we as seamstresses can have a lot more fun with our clothes than people who going shopping in malls. I think that's why I've been thinking about this prints vs. solids thing lately - summer is approaching and with it I want some fun, colourful clothes to wear in the sunshine. Yeah it is a bit of food for thought and each comment here has brought me a different bit of perspective on it. Thanks for stopping by! I think having inspiration, like a Pinterest or Project Runway-esque item would help the doldrums of solid fabrics. You're so right though. If you see someone's work, even moreso if someone sees YOUR work, it's more of a compliment to ask, "Where'd you get that?" than "Did you make that?". It's three things: pattern, skill, AND fabric. YES! I know I'm jumping into this conversation late, but this post really spoke to me. I am drawn to bright, loud, fun patterns on fabric---but I wear a lot of solids. It's tough to pass up those cute fabrics for the solids. I'm trying to sew more "regular" clothes that I'll wear on a daily basis, and this is a good reminder. I have been sewing for about 25 years. I started as a young adult interested in fashion. After marriage and babies I progressed to sewing almost everything that my kids wore as they grew up. I continued to sew for myself too. Through out all of my sewing I would mix plains and prints to get co-ordinated outfits for the kids and to allow plenty of flexibility. I never actually thought about it in terms of boring or homemade etc, my focus was on stuff that was practical, well-made, durable and a bit fun. It worked for the kids clothing very well. I don't sew much for my mostly grown up kids now (cheaper to buy) but i still sew for myself. I have to admit that my fabrics are all plains and looking in my boxes of fabrics you will see a box labeled 'pants fabric' it is almost all black or navy or some other plain dark colour in a good quality natural fibre with a bit of stretch. Tops fabric has a little more variety but still features a lot of plains. Dress fabric is where things get a little more varied and even then it is what the intended purpose of the dress is; a summer dress will be very different than a work dress in colour, print and fabric type. I am laughing because I have practised what you have been describing with little variation for a long time. Some of my flops were the items where I didn't follow this unwritten rule, those garments tended to be dispatched to the charity shops in fairly short time. The other link I hadn't consciously thought through was the home-made vs hand-made. I take it that by home made you are meaning kitsch and unfashionable, stand out in a not good way. This I definitely want to avoid. Hand made on the other hand, where stripes line up and the fabric is cut properly on the grain, with attention to details and quality - that I want. It's a pity that we associate home made with just slightly (or largely) tasteless. I know exactly what you mean and have seen (and done) it. ANd cringed at it too. lol. thanks for an entertaining and thought provoking article. I struggle with that to. I mostly sew for my kids (I am not the size 6 I used to be and it is hard to find patterns that work for my body type). I have found that there is a whole different style for kids. It is called boutique style. There are lots of different patterns and quilting cottons that are being mixed and match. It is a very difficult style to pull off. What I love about it is that it can look handmade but also be trendy. I got a lot of compliments on those skirts at church. Another thing is there is a fine art to combining prints. If all else fails stick with one line of cordinating fabcs. I enjoy having my own style and being different in a good way:) I hope at least some of this makes sense. Great post and interesting replies. And great pinterest board, I think I pinned about ten of them too! I feel like I've spent years trying to work out how to bridge the gap between what I want to sew and what I want to wear. Eventually (The latest version of bridging that gap anway :-) I decided I needed plenty of wardrobe basics in solids, and if sewing them bored me to tears I'd better go shopping for them. *gasp* In the end started collecting the most beautiful solids and "Basics" fabric for my stash I could find, and bit the bullet and pulled out some TNT patterns. I'm getting better at whipping up a few "basics" quickly enough without getting so bored they somehow magically end up at the back of a dark cupboard. However now I'm thinking about what some of your readers wrote about making the pattern be the source of interest rather than the fabric. Perhaps I could do that with the basics - really go to town on the pattern. Then with a base of solids and practical, plain-jane stuff, I'm discovering the things I do sew for love become accent pieces, with their beauty or quirkiness or whimsy becoming the focal point of my outfit, rather than just one more thing in a whole lot of interesting stuff. The basics are becoming a blank slate to create against. Editing. Yeah. Good way of thinking about it. Luckily though, I don't have to be too disciplined as I live in a place and climate where bright cotton prints are fairly common.